You may get many videos, either taken by your camcorder, mobile phones, or downloaded from some online video websites like YouTube, Facebook, Metacafe, Vimeo, etc. What if your computer has limited space for storing those videos? What is the best way to preserve these videos? You may ask. Well, the best way to store and preserve videos maybe burning videos to DVD since DVD can last for a long time and can help your release some disk space. To burn video/audio/photo to DVD on Mac, what you need is a DVD burner for Mac. Here are the top 3 free DVD burner for Mac that allows you to burn videos to DVD for backup. Have a look at them and choose the one you like to burn your favorite videos. Burn is the most well-known free DVD creator for Mac that allows you to burn CD/DVD on Mac. It comes with an easy-to-use interface and can burn data disks, playable CD audio disks, playable video disks and can also copy and write disk images like dmg, iso, etc. Some video to DVD conversion is also supported. Besides, some advanced settings like file permission, disc icon, etc. are offered. In addition, you can personalize your DVD with some custom DVD menus and themes. 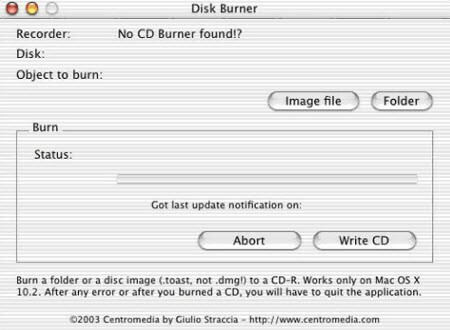 Disc Burner is another great CD/DVD burner freeware for Mac. It allows you to create, organize, share and store all of your digital content on CDs or DVDs. It is very easy to burn CD/DVD. Just insert your DVD disc and choose the files you want to burn and select burn CD/DVD to start the burning process. 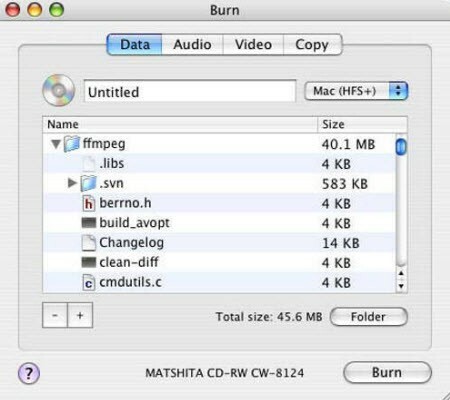 BurnX Free is a simply free DVD maker for Mac to help you burn CD/DVD on Mac OS. What you need to do is to drag and drop the files or folders you want to burn to the main window. You can use sessions to burn multiples files in the same disc (CD only). Besides DVD burning, this Mac DVD burner freeware can also help you erase a CD or DVD. Even though there are many free Mac DVD creators, a large number of people are looking for commercial DVD Creator for Mac and you may be one of them. That's because there are always some disadvantages of the free DVD burners for Mac. For example, it may not allow you to edit your videos like crop, trim, rotate, etc. Or you want to burn photos but failed. Or your video formats are not supported by the Mac DVD burner freeware. Or it is not compatible with the latest Mac OS 10.8 Mountain Lion system. If you are not satisfied with the above three best free DVD makers for Mac, have a try of Aimersoft DVD Creator for Mac, a professional Mac DVD creating software which helps you to burn videos and photos to DVD on Mac with strong video and photo slideshow edit functions on Mac (Mountain Lion and Mavericks included). Various menu templates with more customized settings will bring you absolutely customized DVD. Just free download it and start the pleasant DVD burning journey! It is very true, that we cannot always keep our favourite videos on computer every time. We might have to delete some, in order to keep space for other things which are more important. With this DVD burner, there is no more disheartening and we can burn our videos into DVD’s easily. The three DVD burners for MAC have its own advantages, and more importantly you have also provided us with an option, where if we don’t like the three burners mentioned, then we can even opt for a more commercial and professional one. I really liked this article.